You are here: Home / Ent. / Radical Harlemite Filmmaker Champions Hometown For CrowdFunding Rally With The Duplass Brothers. Radical Harlemite Filmmaker Champions Hometown For CrowdFunding Rally With The Duplass Brothers. (ThyBlackMan.com) Award-winning Black artist Mtume “Core Rhythm” Gant is proud to present his first-feature, I DON’T LIVE TODAY, in a 30-day intensive crowdfunding campaign through Seed&Spark’s Hometown Heroes rally, partnered with Duplass Brothers Productions, Salem Street Entertainment and UnLTD Entertainment. 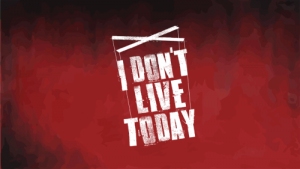 I DON’T LIVE TODAY is a story about a Black struggling painter who has become disillusioned with the art world in New York and, on his final night in the city, wanders the streets on a moralistic crusade to cutting ties to the city and face the demons that he’s tried to keep hidden. Gant had already been in the midst of developing his New York City feature with producers Shant Joshi (PORCUPINE LAKE) and Christopher Everett (WILMINGTON ON FIRE), and saw the rally as an opportunity to access a larger audience while raising funds to take the project to screen. Gant intends to explore New York City with a focus on the underseen parts of the city to reveal the fuller truth about the city that he has lived his whole life in. The film is a modern day morality fable that takes place in the darker ends of the New York arts economy, where the subjects of race, family, loyalty and ethics are put on trial. Though he is a graduate of both LaGuardia High School of Performing Arts and The Acting Conservatory at Suny Purchase, if you ask Mtume, his greatest teacher has been the blocks of New York where he truly honed his own personal tick and voice as an artist. Mtume worked for years as an actor donning roles on stage in plays like FASTER at the Rattlestick Theatre and THE TOILET at the Here Theatre, as well as on films like HURRICANE STREETS and CARLITOS WAY: RISE TO POWER. After spending time trying to work as an actor in Los Angeles, Mtume soon returned to his hometown and quickly became a mainstay in New York’s underground hip-hop community as the rapper Core Rhythm, releasing 3 albums in 4 years and performing throughout the globe. A dramatist at heart, Gant later turned to playwrighting and co-wrote and co-starred in FIELDS OF GREY at Manchester’s Contact Theatre. He then went on to make two poignant short films SPIT and WHITE FACE that won and were nominated for a number of awards premiering at Aspen Shortsfest, Ashland, and Kinofilm Manchester. For additional information, please contact Christopher Everett at spellerstreetfilms@gmail.com.